I'm sure I've said this before, but I love my season ticket seat at the Guthrie's Proscenium Theater (the rectangular red one) - front row center. It's actually in the "cheap seats" section because it's "too close." But even though I get a crick in my neck (like sitting in the front row of a movie theater), I love being close enough to see the color of the actors' eyes and the sweat beading up on their foreheads. I almost feel like I'm in the middle of the action. And a lot of crazy action there is in the late 19th century English farce Charley's Aunt, playing now through mid January. A brief plot summary: two young men at the fictional St. Olde's College in Oxford are in love with a pair of young ladies who are leaving the country tomorrow. They need an excuse to see the ladies and profess their love to them, so they invite them over to Jack's rooms to meet Charley's aunt, a wealthy widower he's never met. When her arrival is delayed, they convince their pal Babs to wear his theater costume and impersonate the old lady. As you can imagine, much hilarity and hijinks ensue (including pratfalls, kicks in the rear, slaps, etc. ), especially when the real aunt arrives and finds someone else using her name! This is a brilliant cast, and it's worth noting that six of the ten cast members are graduates of the joint University of Minnesota/Guthrie training program. Like the Minnesota Twins, the Guthrie has a strong farm system; they grow their own talent, which is on great display in this show. Starting with the talented and charming John Skelley as the title character, or the false version of the title character. He completely commits to this very physical role; at one point he's holding his breath and his face literally turns red as he breaks out in a sweat! John appears to be having a great time as Babs, who is having a great time being Charley's aunt. Except for avoiding the two distinguished gentleman vying for his affection (Colin McPhillamy and Peter Thomson - much more elegant and handsome than he was as the ruler of the Queen's navy), he gets to laugh and flirt with two lovely ladies to his heart's content! Matthew Amendt is also wonderful as Jack, the ringleader of the whole scheme who goes from confident and enthusiastic to exasperated when his plan falls apart. Ben Mandelbaum is adorable, boyish, and incredibly expressive as the young Charley. Every good English comedy needs a sly, mischievous butler who's smarter than those he serves, and Guthrie newcomer Charles Hubbell fills that role well. The three young ladies are also played by U of M/Guthrie graduates and are as lovely and talented as the men. 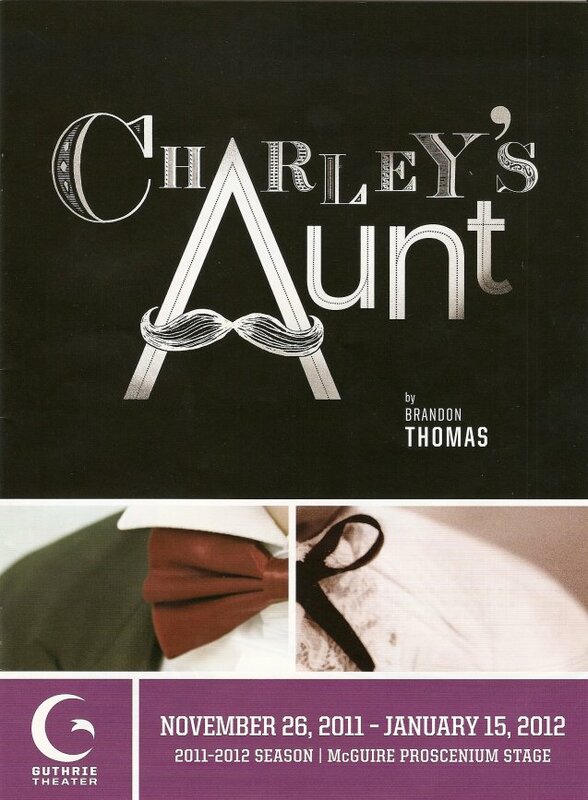 And if that's not enough, Sally Wingert (the Meryl Streep of the local theater scene) brings her considerable talent to the role of the real Charley's aunt. As expected at the Guthrie, the sets and costumes are spectacular. The three scenes of the play each have their own authentic and detailed set that floats or slides in or out. When I first walked into the back of the theater and saw the stage, it was like looking into a Victorian doll house. The men look sharp and elegant in their suits, and the ladies' dresses with matching hats look good enough to eat! And from my front row seat I got a good look at the shoes - smashing. 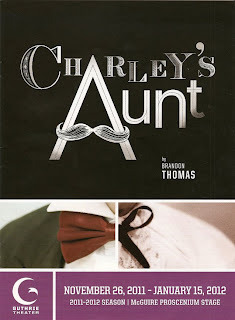 Charley's Aunt is everything a good farce should be - silly and ridiculous, light and funny, and perfectly executed by everyone involved.